You say tomato, I say tomahto. You say lanthanide, I say lanthanoid. Did anyone think Amy made a mistake tonight when she said lanthanoid, not lanthanide? If so, then stay after school to clean the erasers because Amy was right. The IUPAC, the International Union of Pure and Applied Chemistry, won’t stand for it. Despite 90% of scientific literature using lanthanide the ever-vigilant folks at the IUPAC want us to use lanthanoid. And The Big Bang Theory does its part to educate the public. Puh-lease! The word is "Lanthanoid". 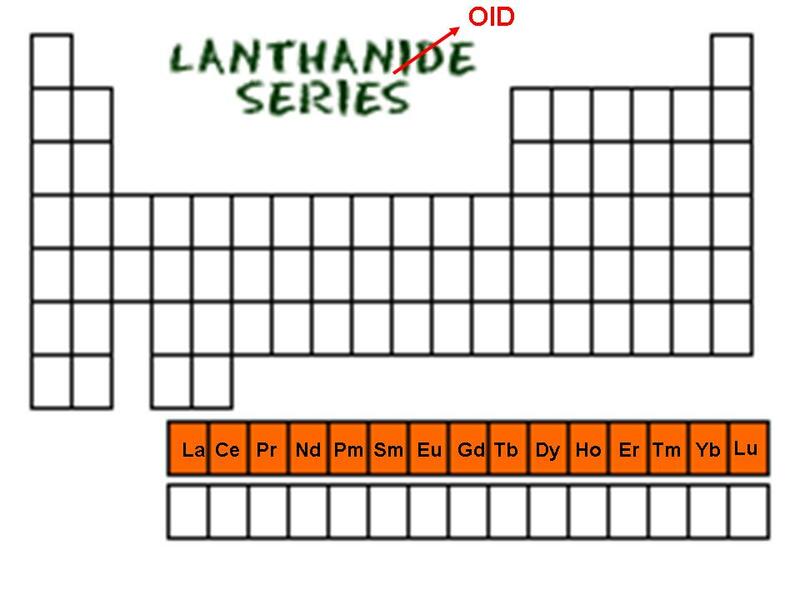 The lanthanoid series of elements is that special part of the periodic table that doesn’t fit horizontally so is usually put at the bottom. The defining characteristic of an element is the number of protons in its atomic nucleus. If you are an atom with 57-71 protons, then congratulations, you are a lanthanoid. From lanthanum to lutetium these elements have room for up to 14 electrons to fill an oddly shaped shell around the atomic nucleus (called the “f-shell”). The strange shape of their orbits make the lanthanoids the under-appreciated miracle workers of modern technology. Lanthanoids make The Big Bang Theory television show possible. Theatrical lighting needs to be bright and just the right color. Lanthanum (57 protons) and cerium (58 protons) rods in arc lamps are extremely popular on Hollywood sets. Praseodymium (59 protons) in aircraft engines strengthens the metals and bring special guest stars to Burbank Airport. Neodymium (60 protons) and samarium (62 protons) make the highest strength permanent magnets. Such magnets are likely found in your TV speakers or headphones. OK, I doubt we use promethium (61 protons) on set, which is always radioactive. If not for europium (63 protons), we’d still be watching Big Bang Theory in black & white, missing a key element in the red phosphors that made color TV first possible in the 1960s. And without gadolinium (64 protons) and terbium (65 protons) there would have been no green. The show could not be edited if all its high-definition data could not be stored on a hard drive using, you guessed it, the easy magnetization properties of dysprosium (66 protons). However without holmium (67 protons), the show could go on. If you watch The Big Bang Theory online, chances are it comes to you on a fiber optic loaded with erbium (68 protons), an optical amplifier. I confess that the next thulium (69 protons) embargo might not be a show-stopper. Ytterbium (70 protons) changes its electrical properties under strain and is a key element for monitoring earthquakes; living in Southern California, we like our ytterbium. And finally lutetium (71 protons), well, its f-shell is full, so one could argue it shouldn’t be a lanthanoid at all. The lanthanoids are not popular just because of their good looks. Why are their names so unfamiliar? 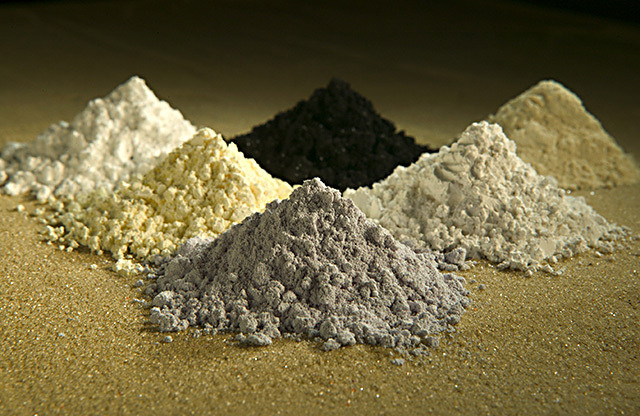 The fact that the lanthanoids sometimes go by the name rare earths might give you a clue. It might, but it doesn’t. The lanthanoids are not particularly rare in the Earth’s crust. And the word earth originally meant that their oxides were highly alkali and water-insoluble. Except they are not. 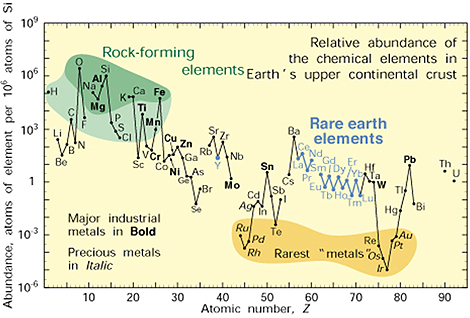 You’d think IUPAC would be happy that we at least we’ve mostly stopped calling them rare earths. The lanthanoids, often called "rare earths", are actually not so rare at all. They are 1000 times more abundant than gold. But the members of IUPAC are not an easily placated lot. In English, the suffix -ide, is already reserved in chemistry for an element that has taken up an electron from another atom thereby forming a negative ion. That’s the -ide in sodium chloride, which is common table salt. Lanthanoids are lanthanoids no matter what element they are or are not bonded to. And the periodic table being periodic, the story repeats itself with the actinoids. If you listened carefully tonight you knew Amy already ruled those out, because they are all radioactive. I was afraid while this week’s episode was taped. I feared everyone on set would ask me how a theremin works. And I had not done my homework. In case this ever happens to you, read on, and I will spare you the embarrassment. This week, Sheldon played his theremin, the eerie sounding electronic instrument favored by avant-guard musicians: from the Beach Boys to Vladimir Illyich Lenin. The theremin came to Lenin shortly after Soviet scientists developed a proximity sensor. 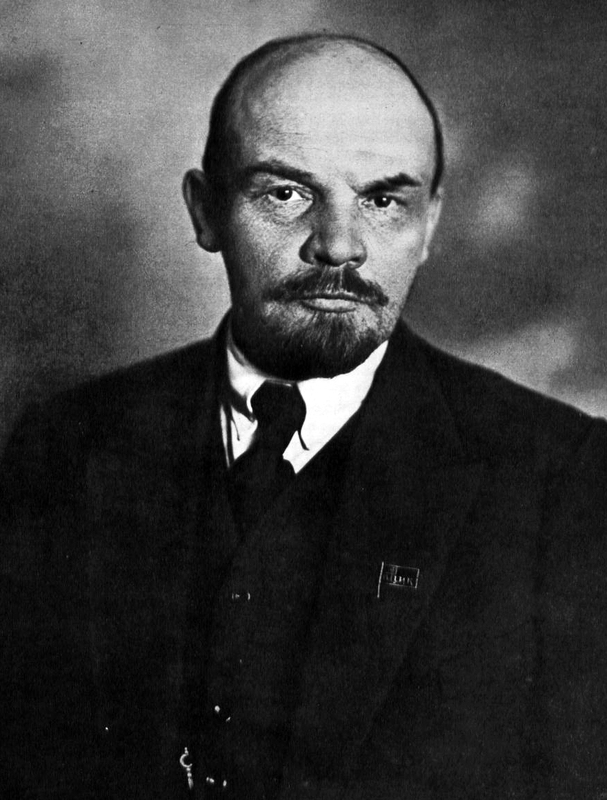 Just like Sheldon, Lenin enjoyed playing the theremin. The key to a Theremin is a so-called “tank circuit”. In a classical theremin you will find a coil of wire connected to two metal plates. The coil of wire is sometimes called a “choke”. That’s because it does not allow fast-changing signals (“high frequencies”) to pass through. The two metal plates are called together a capacitor, because of their capacity to hold opposite electric charges on each plate. Their reservoirs of charge allows fast signals to pass through, but are quickly depleted by slow-changing signals (“low frequencies”). The parallel plates work in exactly the opposite sense as the coil. One element blocks low frequencies, and the other blocks high frequencies. Putting the two together allows only a narrow range of frequencies pass through. Energy in the circuit sloshes around, between the charge on the capacitor and the current in the coil at a well calculable rate. The specific frequency passed by the tank circuit depends sensitively on the values of the capacity of the parallel plates to hold charge (its “capacitance”) and the inability of the coil to change its current (somewhat opaquely called its “inductance”). Every body and everybody has inductance and capacitance. If we connect our tank circuit to an antenna you can change the resonant frequency by simply moving your hand near it, adding your own capacitance and inductance to the circuit and changing its tune. 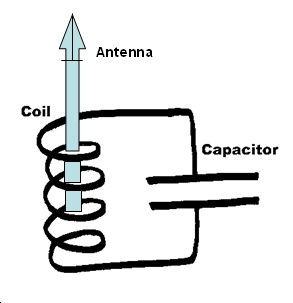 A "coil" and two parallel plates (a "capacitor") form the heart of a theremin. When you play a classical theremin, you don’t control the audio frequencies directly. Our ears can only hear thousands of vibrations per second. That’s fairly slow for electronics, and the size of the coils and parallel plates would have to be enormous. It is much easier to build electronics working at higher frequencies. So, theremin designers make use of a mathematical trick. It turns out to be easy to find the differences between frequencies. So by comparing two “tank circuits”, one you are modifying with your hand, and one without your intervention. The frequency difference is sent to the theremin speaker. Working off the difference is a common trick. Your AM radio (if you still have one) has a tuner, but you are not tuning the tank circuit. Rather, you are tuning another circuit, close to the frequency you want to receive. Your radio uses the difference to find the signal. Scrabble players take note; this fancy trick is called superheterodyning. The key here is the changing signals. When physicists want to talk about the changes of values, rather than the values themselves, they need to work with differences, also called “differentials”. The equations describing them are called “differential equations”. Differential equations are key to understanding the flow of currents in the tank circuit of a theremin. And the solving of differential equations was of course the main point of tonight’s story. Unlike many other types of equations, there is no definite method to solve a differential equation. Often physicists are led to try a few tricks, look them up in dusty old tomes, or ultimately to guess. In modern times, we can enter the equation into a computer and hope it can find the answer. Leonard had the brilliant idea this week to skip that step, and have the iPhone app recognize the handwritten equation and solve it directly. Common differential equations have names. The solution to the tank circuit is a “sine” function. The “spherical Hankel function” mentioned tonight comes up when solving vibrations of spheres. The laws of population growth give a differential equation solved by “exponential functions” which is, unfortunately for us, the fastest growing of all the elementary functions. I’m no iPhone designer, and the white boards were a salient part of the story this week. Luckily we found a friend-of-a-friend of mine, Robert McNally who designs iPhone apps for a major online dating company. Everything you see in this weeks show is 100% real, quality, iPhone development @%^#!. Click on his name above, and you will learn a little of the inside story of the dueling app software. Anyway, nobody liked my other iPhone app idea. I want to make a Geiger counter with an iPhone. I think it could work. Just look for single bit errors in the iPhone memory due to ionizing radiation. The error rate is proportional to the radiation. So now they are out there. Two good ideas for iPhone apps. Elves, the shoemaker is waiting.